A Dynasty Lost. During the Super Bowl era, the measuring stick for a team to be considered a dynasty was winning back to back championships. Poised to do that, were the 1983 Washington Redskins, fresh from their Super Bowl XVII win over the Miami Dolphins, had roared through the ’83 season on a high. Man, with Riggo, ‘The Hogs’ & ‘The Fun Bunch’ this team was fun to watch! As I sit here and think about it…this could have been Joe Gibbs finest coaching job over a Hall of Fame career. A coach of a defending champion normally has to fight off complacency within his team trying to keep them from becoming ‘fat cats’ and playing with the hunger that drove them to a title. 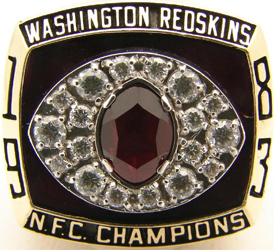 Most defending champions try to stay the course and hope other teams won’t catch up to them, yet the ’83 Redskins were better than the team that won it the year before. Let’s take you back to 1983…Ronald Reagan wanted to get re-elected…MASH aired its final episode (hated that show)…and the NFL had returned to its roots with the Redskins offense bludgeoning its way to the ’82 title with Hall of Famer John Riggins running “50 gut” right down team’s throats. Then a funny thing happened, the Redskins caught teams in a vice. Gang up to stop Riggins and the “Fun Bunch” receivers were wide open behind the drawn up linebackers and points rang up all year long. 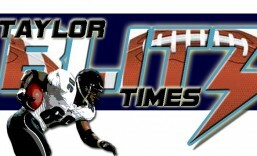 They set the NFL record for season scoring at 541. Joe Theismann went from being a serviceable quarterback to league MVP throwing for 29 TDs. 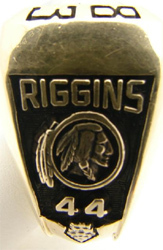 Riggins went on to set the single season TD record at 24 while rushing for 1,347 yards. Coming off the only time a kicker was named MVP, Mark Moseley in 1982, set the kicker record for scoring at 161. Where this team was solid on defense was up front with big Dave Butz and Darryl Grant at DT swallowing opposing running attacks. Dexter Manley was in his prime as a DE caving in the pocket from the QBs blindside. Steady linebacker play came from Rich Milot, Neal Olkewicz, and Mel Kaufman. The secondary was bolstered by sensational rookie Darrell Green. The Redskins were never spectacular on defense but always ranked among the league’s best and 1983 was no different. They marched into the ’83 playoffs as a powerful defending champion…so what happened?? They peaked 6 quarters too early. After the 51-7 dismantling of the Los Angeles Rams in the divisional round, they went back to basics and were grinding out a win in the NFC Championship over the 49ers. Looks can be deceiving. Although the Redskins had taken a 21-0 lead, a closer view and you saw Niners cornerbacks Ronnie Lott and Eric Wright were smothering Charlie Brown and Art Monk for the most part, allowing other 49er defenders to solely focus on Riggins. They could cover them man for man. This slowed Washington down and Joe Montana almost pulled off a spectacular comeback losing 24-21 with some dubious penalties called against them late in that game….yet I digress. The point being, this served as the blueprint for what was to come 2 weeks later in Super Bowl XVIII when the Raiders, with even better cornerbacks in Lester Hayes and Mike Haynes, handled the Redskins receivers allowing the front 7 and safeties to attack Riggins. C’mon, 38-9?? Really?? I still can’t believe they were beaten that convincingly until I have to remind myself of an NFL truth: The highest scoring teams in history: 1980-1981 Chargers, these ’83 Redskins, the ’84 Dolphins, My ’90 Buffalo Bills, the ’98 Vikings, the 2001 St. Louis Rams, and the 2007 Patriots all EVENTUALLY ran into a defense late in the playoffs and were all knocked off. The lone exception is the ’99 Rams. This was a team that right before Super Bowl XVIII were being called one of the best teams ever and all they had to do was win this one game. 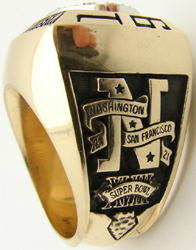 This is the ring commemorating the NFC Championship for getting there. Best team ever? Not quite… Best Redskins team ever?? I think this team would give the 91 team a run for its money. If you think about the ’83 Redskins and the Super Bowl XXVI champion, they really looked alike. Who would win between these two if we had a mythical match-up?? 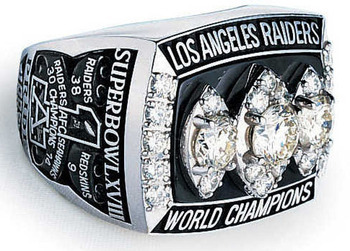 When Marcus Allen broke out with that famous run for LA in Super Bowl XVIII, you knew Al Davis was going to go with something similar to the past two rings…anyway Raiders 38-9 over the Redskins. Tom Flores became a great coach with not only his second Super Bowl win in 4 years. He knocked off a defending champion that was 1 game away from being labeled a dynasty. How did the Raiders kill the defending Redskins like that? Beating the Redskins yes but dismantling them like that? It’s still baffling some 31 years later. The highest scoring team in history only scoring 9 points? NFL Films shows you and tells the story. Raiders defense, Raiders defense, Raiders defense! John Madden called the game, what more could a Raider fan want? 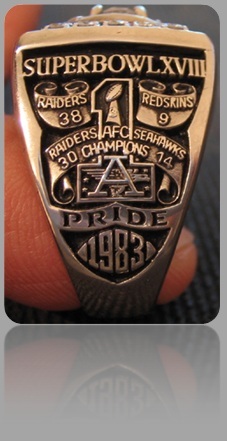 What most fans don’t remember was going into the ’83 AFC Championship Game, the Raiders had been swept by their division rival Seahawks during the year. So Seattle was a formidable foe. The game had a weird feel to it because it was drizzly and grey. I remember Marcus Allen playing with a black eye, swollen like a boxer. They ran over Seattle 30-14 and rewrote history. Had Lyle Alzado controlled himself, the Raiders could have won that game in the 1982 playoffs (loss to Jets 17-14) and could have won Super Bowl XVII. How do we know this? 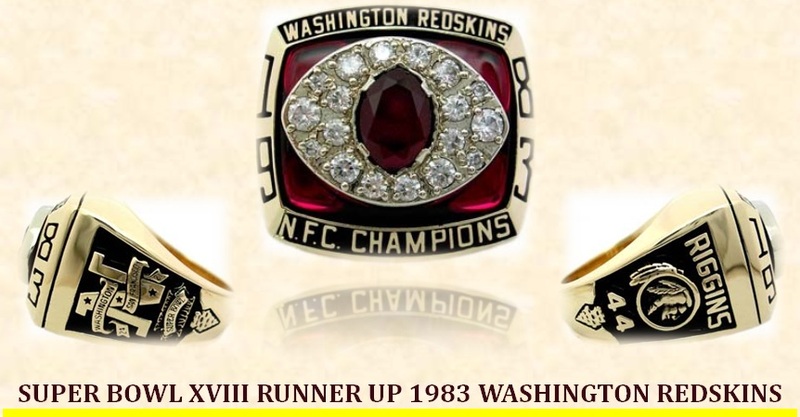 The Redskins (who won XVII) was exceedingly stronger in 83 and that beating the Raiders gave them was epic. Easily the strongest team in Raiders history with a mixture of old pros and young players that made up the core of this team. Two Heisman winners on offense with Jim Plunkett and Marcus Allen. Old pros like Cliff Branch and Todd Christensen. 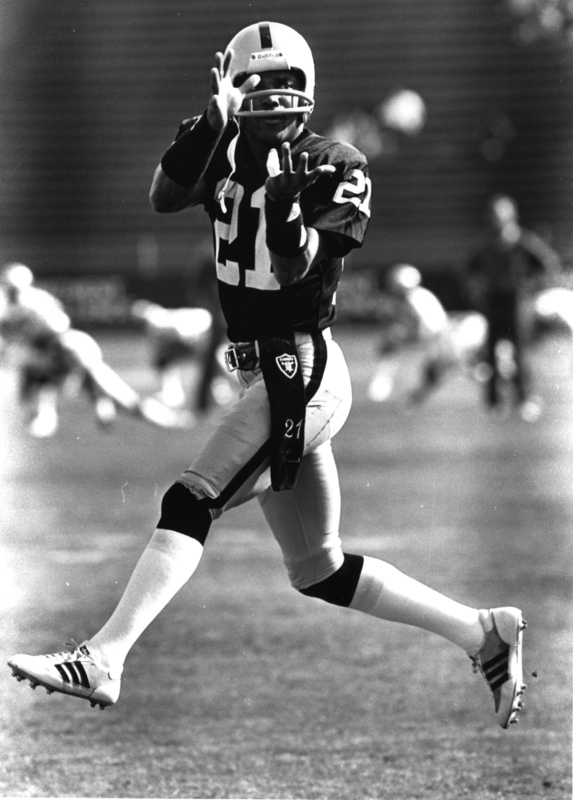 Greg Pruitt was brought in to return kicks and set a league record for punt return yards. Really solid defense…Reggie Kinlaw dominated from nose tackle with Hall of Famer Howie Long, the late Lyle Alzado, Greg Townsend on the defensive line were hard to move on the point. They had the heaviest set of inside linebackers in Bob Nelson and Matt Millen. At 250lbs. each could take on and shed guards if they had too. Rod Martin and Ted Hendricks ( the U) were the outside ‘backers with a lot of range. Mike Davis and Vann McElroy were really solid safeties. This defense had no real holes and then we get to Lester Hayes and Hall of Famer Mike Haynes. One on one coverage at its finest that culminated in this performance against the Redskins receivers. Charlie Brown and Art Monk combined for 125 receptions for 1,971 yards and 13 TDs during the season. Hayes and Haynes held them to 4 rec. for 119 yards…60 came on one play. It reduced the highest scoring team in NFL history to 1 scoring drive in the 3rd quarter. The next year in 1984 they started to give up some passing yards. 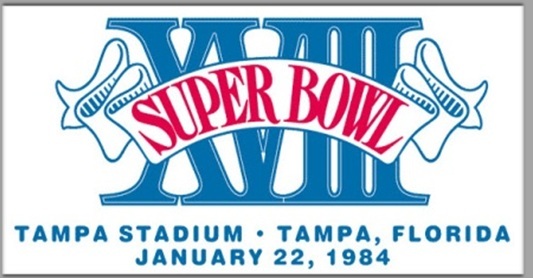 Yet Super Bowl XVIII they were at their zenith. 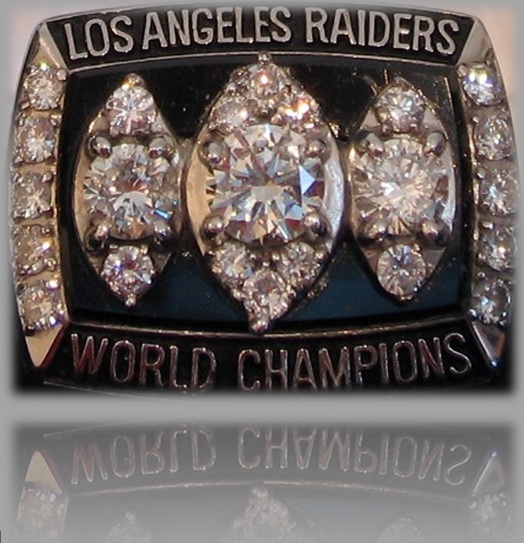 It was also the last championship won by the Raiders under Al Davis. An original AFL pioneer who remained a separatist at heart and on all of the Raider’s Super Bowl winning rings, used the AFL “A” and not the AFC “A”. 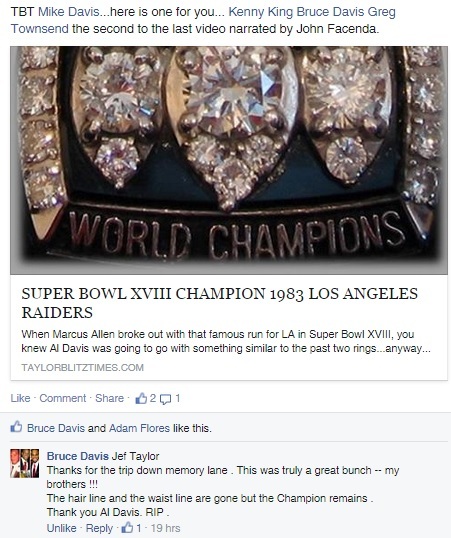 Long live the American Football League, as we lost a pioneer back in 2011 when Al Davis passed. In 2010 I attended a game in the Oakland Alameda County Coliseum and the ghosts of all those great Raider moments played out as I looked around that stadium. I met many former Raiders at the game and just missed Coach Flores but definitely would have loved to have met Al Davis. This is dedicated to the memories of Al Davis, along with Al LoCasale, Todd Christensen, Lyle Alzado, Earl Leggett, John Facenda, and Charlie Sumner.